There are 4 posts tagged problem solving (this is page 1 of 1). Q1: Why do you think Critical Thinking is an essential skill to be built across the organization in today’s context? Q2:How can Critical Thinking be developed? Share interventions that work best to build Critical Thinking? Q3. Who is the owner and stakeholders involved in this process of infusing Critical Thinking across the organization? Q4: What are the road blocks that L&D practitioners & Managers are likely to face in implementing these change intervention? Q5. What are the benefits that organizations can derive from these training interventions? This is the reason why I love tweet chats – in just about 30 minutes of time, so many diverse perspectives came to the fore from equally diverse participants – talk about the power of community in learning! Also read: My article series on critical thinking at Pearson TalentLens Blog. I am so glad to announce that my next book is just released. It is an actionable guide titled “Implementing Lean Six Sigma in 30 Days” that aims to help readers in understanding the Lean Six Sigma methodology and solve problems that undermine quality and inhibit efficiency. This book is for business owners, quality improvement professionals and anyone in general who is driven by the desire to improve their team performance. I co-authored this book with my colleague and friend Gopal Ranjan (to whom I am so grateful) and this book is published by ImPackt Publishing, UK. How can we improve? This is one of the most fundamental, but challenging, questions an organization can ask itself. It is never easy, but the ability to drive significant change that can bring positive results is immensely important for a business that wants to be successful in a rapidly growing market. Lean Six Sigma offers a way of answering this question, combining the approaches of both Lean and Six Sigma in a way that offers an opportunity for exponential improvement in a way that is manageable, flexible and sustainable. Spanning a month’s implementation process, this book will take you on a Lean Six Sigma journey, where you will gain a clear understanding of the fundamental principles, and develop a clear perspective of the process as it unfolds. From defining the problems to be tackled, to their measurement and analysis, this book leads you towards the stage of innovation where you can take steps that ensure and sustain improvements. So, if you are a quality professional or an improvement consultant, you can use this book to guide your clients/organizations through their Lean Six Sigma journey. And yes, when you guide your customers through improvement journey, do not forget to align the content (the concept and implementation method) to your client/organization’s unique business context. Because in the end, any methodology or best practice only delivers results when content intersects with context. It is this intersection where meaning is created. 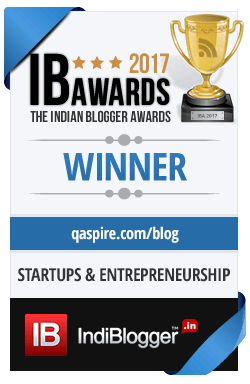 Stay tuned to QAspire Blog: Subscribe via RSS or Email, Join our Facebook community or Follow us on Twitter. In pursuit of improvement, it is very important to get to the root-cause. If you don’t know “why” an improvement is needed – you won’t improve in the right areas. “Why” should come before “what”, “how” and “when” because “why” clarifies the direction. The hallmark of a learning organization is that they ask “why” more often than others. It is crucial to ask right questions and get to the core – be it a decision making process or getting to the root causes. The technique was originally developed by Sakichi Toyoda and was later used within Toyota Motor Corporation during the evolution of their manufacturing methodologies. It is a critical component of problem solving training delivered as part of the induction into the Toyota Production System. Real problems are like onions – layered and not always easy to find. “Five Why” is a great method to uncover each layer and get deeper into actual reasons for failures/defects. You can define your career goal and ask “Why do I want to achieve this goal?” – whatever the answer, ask a "why” again. Check if those are the right reasons. When someone from your team suggests an improvement, ask “Why is this improvement needed?” and then repeat why for 5 times. When you encounter a problem in your operations, you can ask “Why did this problem occur?” and then dig deeper with five why’s. Five Why can be used for assessment of our decisions (self-analysis) and is also a great tool to interview people to find facts. Objectivity is important to ensure that you focus on “why” and not “who” – else it turns into a blame game. The great thing about this simple tool is that it does not require any sophisticated tools or software. It is easy – and can lead to lot of common sense thinking. Used consistently, it can also lead to new ways of thinking. So the next time you struggle with a problem or decision-making process – you know what to do! People are not human robots. They will make mistakes. A manager’s true measure is the way he treats his people when they make mistakes. I was thrashed by my boss way back in 2001 for a minor mistake I did working on a project based on a very new technology. I literally had tears in my eyes after I was shouted upon, knowing that I had worked on the module for 18 hours at a stretch without taking a single break, learning the technology and getting job done. My mistake was minor, but the one my boss committed was major. He lost my respect. Shouting was his way of reinforcing the belief that he was in charge. I moved on! Another interesting case happened with one of my friends Alan who was a tech lead with a multi-national company. He had accidentally replaced the production database with an incorrect version leading to overall application failure. Alan knew that he would get a beating and probably may lose his job. While he was still preparing himself mentally for the eventuality, his manager approached him. He entered with a smile on his face and said “I know this is serious, but I am also sure you would do whatever it takes to correct this. Let us put our best and get this back on track”. Alan and his team worked overnight to correct it next morning and client really appreciated this in form of an encouraging email. A few days after this incident, the manager called Alan in the canteen to share a cup of coffee. It was then that the manager inquired about the root cause of such a mistake. The manager informed Alan that such mistakes should not have happened and that he needs to be careful in future. A couple of years back, as a QA Manager, I was reviewing a troubled project. When I interrogated the project manager, he started pointing specific mistakes of each team member. He never acknowledged that he was responsible for this and that it was a team mistake and not individual one. He exposed his team members instead of protecting them. These diverse experiences have shaped my management style. Here’s what I learnt from these experiences. When someone make a mistake, keep your cool and focus on the immediate correction. Shouting/thrashing just puts people off and solution/correction takes longer. It adds to a lot of stress – for a manager as well as for the team members. Being a manager does not give you a right to be rude to your team. Sit next to the team member if you think that will help them. Be around when they need you. Treat people well when they least expect it – and see the wonders it does to bring things back on track. This is a great time also to let your people know that you trust them. Reinforce their confidence. Protect them and not expose them. Schedule a separate interaction after the mistake is resolved – to do causal analysis and plan preventive measures. This should be done with a focus on problem and not an individual. Idea is not to blame anyone or point fingers. Try and convert each mistake into a learning opportunity – making mistakes is productive as long as team doesn’t repeat the same mistakes again. “To err is human, and to forgive, divine”. Do all managers/leaders acknowledge this?